Carnations are usually 2- to 3-inch flowers on 1- to 2-foot stems. However, some miniature carnations can be very small, some less than 1/2 inch in diameter. 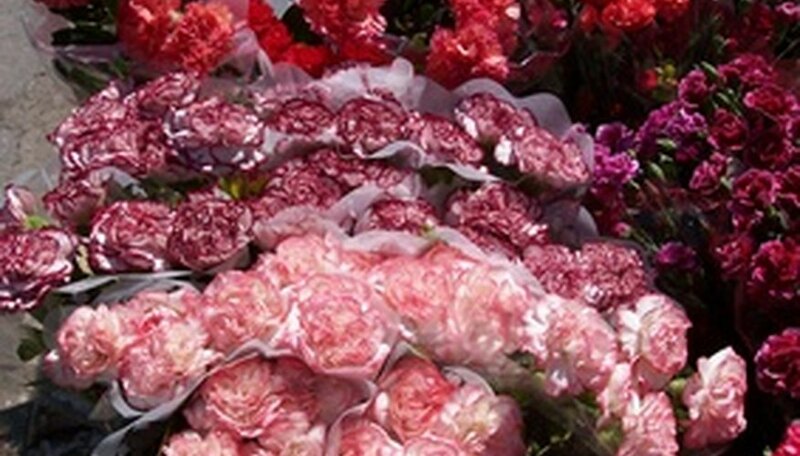 Carnations are grown in a wide range of colors, including white, yellow, pink, purple and many others. As cut flowers, they can last as long as three weeks. Grown in soil, carnations are popular because the blossoms are so long lived. You can propagate carnations by several methods. Seeds are a good way to start carnations. Carnations are often also propagated by cuttings and layering techniques. The propagation technique that is best for you will depend on your location and the type of carnation you are growing. You can often start carnation plants from seeds. Not all carnations produce seeds, and some carnations will produce seeds in some climates but not in others. When growing carnations from seed, follow standard seed starting procedures. Plant your seeds in moist sprouting media and place the seeds in a warm, dark area until the seeds sprout. Once they have two leaves, begin exposing them to sun for an hour a day and increase the time in the sun by an hour per day until your young plants can take full sun. If your carnations are of a variety that produces seed in your climate, collect the seeds and keep them in an envelope for planting the next season. In many cases, you can grow carnations from cuttings from a mature plant. To grow carnations from cuttings, make a long, angled cut on a woody stem from an existing plant. Dip that cut end in rooting hormone. Make a hole in a pot filled with peat moss or other rooting medium using your finger and slip the hormone covered stem into the hole. Cover the stem and keep the medium moist for four to six weeks to allow roots to form. Layering is a way of triggering root growth on part of an existing mature plant. To propagate carnations via layering, nick the bark of an existing carnation plant. Dip the nicked portion in rooting hormone and curve the stem downward until you can bury it in the soil next to the donor plant. Water thoroughly and wait four to six weeks for the nicked portion to grow roots. Dig it up, cut it and plant the newly rooted plant in a new pot or location. Under normal growing conditions, your carnation plants will need four to five hours of sun, at minimum, per day. They will need to be watered once a week. Over-watering can cause the foliage to turn yellow. However, when sprouting, rooting or layering, be very careful never to let the soil dry out. Plants being propagated via rooting and layering will benefit by four to five hours of sun per day.